His hit song The One and Only has turned out to be something of a self-fulfilling prophesy for Chesney Hawkes, for not only has he struggled to repeat its success, but Buddy's Song is also his only movie of any note at all. And, frankly, you can see why. Nigel Hinton has done his popular teen novel a major disservice with his clumsy adaptation that failed to convince the younger members of the audience, while boring the pants off their parents. 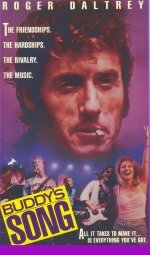 Roger Daltrey (who shone in a BBC Schools version of the book) gives a knowing and willing performance as Buddy's teddy boy dad, but Sharon Duce and Michael Elphick settle for caricatures. Drama starring Roger Daltrey, Chesney Hawkes and Sharon Duce. With everyone around him apparently behaving without rhyme or reason, especially his parents, teenager Buddy takes refuge in music. However, rather than cover the 1950s rock numbers his teddy-boy father Terry adores, Buddy aspires to more personal material.